Marvel Legends DARK PHOENIX Exclusive Figure from TRU 2 Pack HASBRO X-Men Rare! Marvel Legends MARVEL'S PHOENIX 6" Figure X-MEN Jean Grey Juggernaut Series. Condition is Used. Shipped with USPS First Class Package. This auction is for the marvel legends figure pictured and titled above. The figure is adult owned and was only displayed. You get the figure as it sits with exactly the Accessories/shown. Please do not expect any parts (or baf parts not shown). I do combine shipping. There are no major issues with the figure unless it is mentioned above. Please check my other auctions, I am listing many marvel legends, GI Joe/transformer modern and vintage figures/toys. 2016 HASBRO - MARVEL LEGENDS. MARVEL'S PHOENIX. I DO THE BEST ON INFORMING ABOUT ANY PRODUCT SPECIFICATIONS AND PRODUCT'S CONDITION. Marvel Legends PHOENIX Juggernaut Build-A-Figure Series 6" Figure 2016 X-MEN. Condition is New. Shipped with USPS First Class Package. Hasbro Marvel Legends 6 inch Dark Phoenix X-Men 2 Pack TRU Exclusive Bird Only. Condition is used but practically new as I am the original owner and it was rarely handled. Smoke free home. Shipped USPS First Class. New and never opened. Seal is still in tact as shown by picture. Shipped via USPS Priority Mail which comes with $50 insurance. Marvel Legends PHOENIX Juggernaut Build-A-Figure Series 6" Figure 2016 X-MEN. Condition is New. Check pictures for the condition of the box. Shipped with USPS First Class Package. JUGGERNAUT BAF SERIES. MARVEL LEGENDS. SEE PHOTOS FOR CONDITION! SDCC Convention 2018 Exclusive. Ages 14 and up. 1x Diamond Select - Marvel Gallery White Phoenix Statue. Have an issue with your order?. New, factory sealed. Item condition. If not paid within 48 hours an unpaid item case will be filed. This 1/10 statue looks great displayed alongside other ARTFX statues. Kotobukiya SKU: MK260. ToyBiz TOYS. Fiery Phoenix Power Action B20. Card is very flat and is in excellent condition. Marvel X-Men Phoenix Jean Grey Bowen mini statue, Very Limited, Rare! Up for sale is a brand new X-men Phoenix Jean Grey mini statue by Bowen. Packaging is in good condition, despite some wear and picture glare. Statue is brand new factory sealed. This item is a must for any fan. All international buyers are responsible for any custom fees. All my item are shipped double boxed, and all fragile items will be shipped with insurance. Bid with confidence, Satisfaction guaranteed. Check out my other auctions for great deals. Dark Phoenix - Dark Phoenix Rock Candy - FunKo Free Shipping! In great shape! From a smoke free collection. What you see is exactly what you will get. Limited to 5,000 pieces. By Diamond Select Toys. Condition: Unused, SEALED, in very good condition. We have provided the best quality and quantity of image that we are capable of providing. NO OTHERS ARE AVAILABLE. 5" The Dark Phoenix Saga Edition Marvel. Gladiator (1995, punching motion). 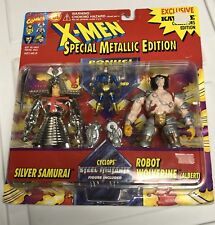 Space Wolverine (1995, silver, claws pop-out & lock back in). Space Wolverine (1995, gold, claws pop-out & lock back in). Corsair (1995, black arms). Item is actual one pictured unless there are multiples for sale. The card has a small bend in the lower right hand corner front. Otherwise the card is in very good condition.The bubble is in excellent condition. PHOENIX 6" Build-A-Figure Juggernaut. Marvel Legends. X-Men Series. Condition is New in Mint condition. See pictures for full detail. Quick shipping. DARK PHOENIX 2016 Marvel Legends Series Figure TRU Exclusive Loose. Condition is Used. Shipped with USPS Priority Mail. Features light up hair and eyes. From the 1996 Marvel Universe series produced by Toy Biz. But the batteries can be replaced. Note: Has tiny tear on the right side of box- does not effect the seal. This item is in exactly as pictured condition. Rare Vintage Original X-Men Phoenix Saga Phoenix! 1994! Sealed! MOC! I've tried the best I could to get photos of these thing but i'm not so sure they show as well as what they do in person. 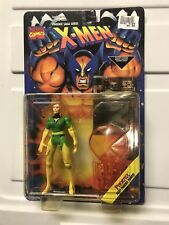 Diamond Select Toys SDCC & GameStop Exclusive X-Men Dark Phoenix #1/6000 New. New sold as is look at the photos thanks for looking. Free shipping to us only thanks. I would be more than happy to send whatever you would like. I'm more than happy to work with you. Rare Vintage Original X-Men Phoenix Saga Space Wolverine! 1994! Sealed! GET YOUR MR. SINISTER NOW! IN GOOD CONDITION COLLECTIBLE NOT MANY WERE MANUFACTURED . In FANTASTIC CONDITION.